Soup is amazing. 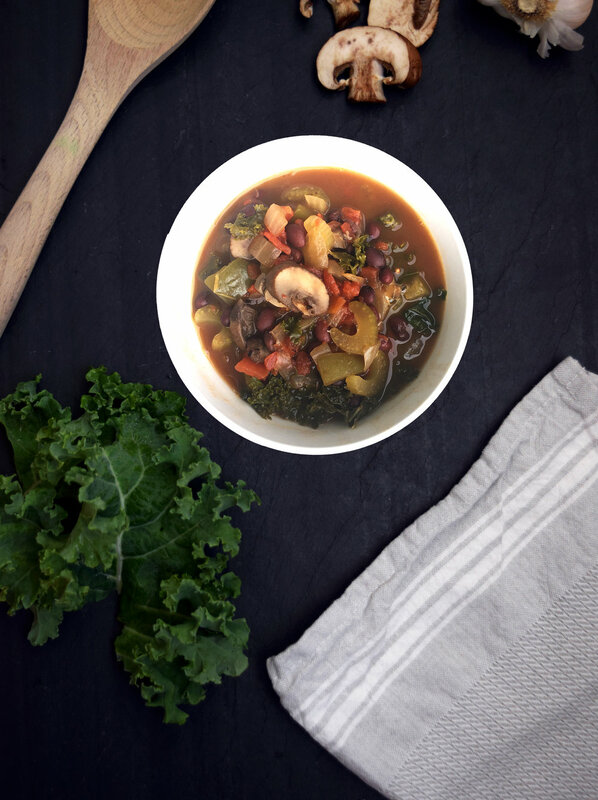 It's like winter's salad and this hearty soup is my go-to meal this fall. It has so many different textures and tastes that I just love and that make me feel so nourished and healthy. Making soup has become one of my favorite activities. It's just such a relaxing thing to do and then you have this delicious creation that you can share with your family and friends. I usually make a big pot of it over the weekend (while watching NFL RedZone) and nurse it throughout the week. Trust me, this soup is so yummy and you're going to enjoy it even more when you remember all the health benefits you will receive from it. Just to name a few...mushrooms contain the mineral selenium which helps with inflammation and detoxes cancer causing compounds in the body. Black beans are excellent for healing heart disease as they help lower the amount of cholesterol in the blood. Green peppers are full of Vitamin-E which will keep your skin and hair looking fresh. And of course Kale, the most nutrient dense plant in existence, is packed full of antioxidants which combat aging and damage to your body, has tons of Vitamin-C and even fights cancer! Fill your beautiful body with disease fighting, anti-aging, skin glowing, vitamin and nutrient filled goodness!